As futuristic as the notion of hands-free, semi-robotic farm machinery may sound, the reality is that space-age GPS technology, capable of delivering significant productivity benefits and improved environmental outcomes for farmers in the Innisfail district has been rolled out in time for the 2013 planting and harvesting season. It’s all part of an exciting project being undertaken by CANEGROWERS Innisfail and funded through the federal government’s Reef Rescue initiative. 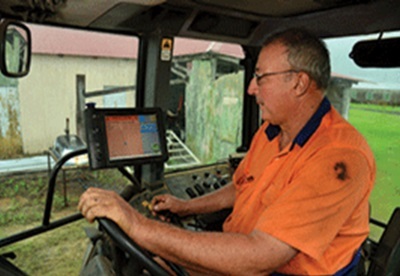 Considering that the cost to an individual farmer of establishing a GPS base station on their own is in the vicinity of $17,000, the opportunity to access the CANEGROWERS GPS base station network at a fraction of that figure will represent a substantial cost saving to the individual grower. “It’s about making it more affordable, it needed someone to take the initiative and we’ve taken the initiative to put it together,” CANEGROWERS Innisfail Chairman Joe Marano said. “It’s saving each grower $17,000. As an early adopter of agricultural GPS technology, Mr Marano has been progressively phasing GPS into his operations since 2006 with positive results. It is technology that he’s eager to see rolled out across the district so other farmers, young and not so young, can benefit equally from the potential productivity gains and positive environmental outcomes that go hand-in-hand with this modern, scientific approach to farming. Mr Marano first engaged GPS with planting and spraying. The benefits were immediate. “When we’re spraying now, we don’t spray unless we’re using GPS because it makes it so much easier,” Mr Marano said. “We don’t have strips missed that haven’t been sprayed and we don’t overlap the spray because you’re going down that same track all the time and you’ve got the correct width in there and it makes it so much easier. 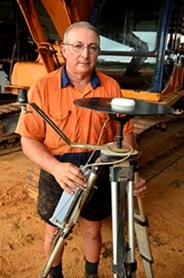 Mr Marano presently operates a GPS base station in a fixed position on the roof of a shed at his Mourilyan farm. The base station is linked to the GPS system in the cabin of his tractor by radio control, with the combination of the terrestrial ground reference and the data from orbiting satellites providing a highly accurate differential positional reference. Jo Marano has found immediate benefits using GPS on his farm, where he uses the technology for planting and spraying. Once the rows are marked in the system, the GPS offers full repeatability, meaning the markings obtained during the first pass of a paddock in year one of a planting cycle can be stored and used repeatedly for spraying, fertilising and harvesting of ratoons in future years. Mr Marano also utilises a tripod-mounted mobile GPS base station for his contract work on other farms beyond the range of his Mourilyan base station. 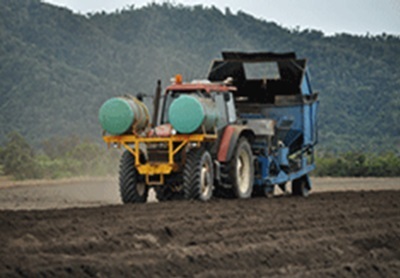 Provided the mobile base station is located in precisely the same position each time on the farm that is being worked, the tractor or harvester will be able to repeat the same path it has in previous years. “The big advantage, apart from fertilising and spraying, is the harvester,” Mr Marano said. “When you’re harvesting at night time or harvesting sprawled cane in the daytime, it’s hard to see where the actual stool is. Potential benefits stemming from GPS, including reduced fuel usage, less damage to the stool, less unnecessary tillage, and minimised controlled use of fertiliser and herbicide also means good news for the environment. As another plus, the fact that data is constantly being stored by the GPS means that less effort is needed with paperwork to document chemical usage as much of the data is readily available. “It gives you repeatability of your positioning, you can go back to the same spot within a block and carry out a different operation,” Ms Telford said.